The Seattle Shambhala community is excited to welcome Elesa Commerse and Acharya Susan Chapman this April for a weekend program to strengthen our connections with one another: The End of Suffering: Claiming our Vulnerability as Strength. 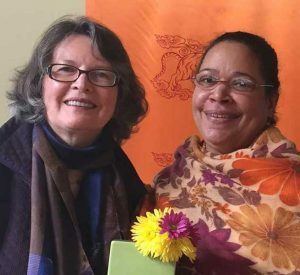 We wanted to know more, so we spoke to Elesa Commerse and Acharya Chapman about their experiences, their inspiration, and why this program is so important. Q: What are your backgrounds, how did you become teachers, and how did you become connected to each other in terms of teaching? Elesa Commerse: That’s such a beautiful question, so thank you for asking that. … I’ve always had a very high regard, just a deep and ongoing longing, to learn and maintain a beginners mind. I just feel so blessed by the teachers I had in my young life. Those teachers really poured themselves into me and helped me become who I am, which is, I feel, a person who basically longs to be of service in the world. 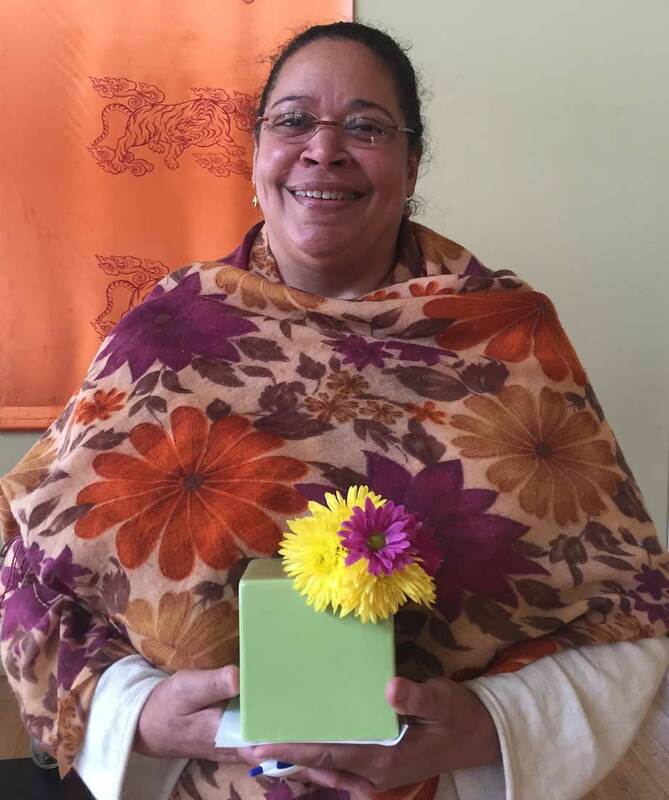 I traveled from Chicago to Colorado for Susan’s beautiful workshop at the Shambhala Center there on The Five Keys of Mindful Communication. I met her through reading her book, reading it several times, and then meeting her and Greg [Heffron] in person in Colorado and instantly falling in love with her as an embodiment of the teachings. I recognized the deftness and profound skillfulness she has as a teacher who is able to help liberate, and I just wanted to be of service to her as well to help spread these tools. You know, each one of us is a human being and that gives us the capacity. But in order to realize that capacity we need good tools. She’s provided us with this magnificent toolkit and so we just need people to know that it’s there and give people the opportunity to work with it and develop their own skillfulness with tools. So I hope that’s helpful as a way of answering the question. Susan Chapman: Thank you Elesa. I think I’m just going to go back to ten years ago. 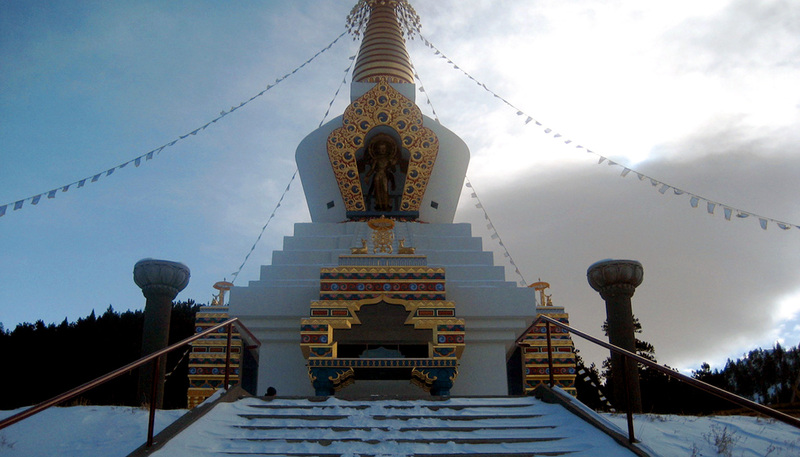 I came out of Gampo Abbey after being there for almost 11 years, actually 9 years non-stop, and I had the wonderful opportunity to mentor with Pema Chodron pretty much the whole time. And in that environment, the precepts of mindful speech were so important that when I came out I really wanted to dedicate myself to helping myself and others look at the way our speech can either trigger suffering or offer an opportunity to interrupt suffering. And at the Abbey I explored simple methods for doing that. So my book [The Five Keys of Mindful Communication] came out of that. It was an attempt to use something that’s very neutral like the red light and the green light to simply recognize how our communication effects our own mind and heart, as well as each other. So then Elesa showed up at Shambhala Mountain Center a few years ago and I instantly realized I was in the presence of a teacher who I could learn from. I said in my book that I was greatly influenced by Dr. Martin Luther King, Jr. and others in the 60’s who emphasized love as opposed to reactivating retaliation as a way of reacting to injustices in the world, so I was absolutely delighted by the way that Elesa embodied teachings of Dr. Martin Luther King, Jr. and Thich Nhat Hanh and people that I’d really admired for their peacemaking skills. And she’s taught me a great deal since then. She also joined us in Europe a couple of years ago and also Washington DC. So we’ve had opportunities to be together and I feel she’s one of my long-lost dharma sisters. We really love each other and appreciate each other a lot. Q: You both mentioned The Five Keys of Mindful Communication. In the program description you also talked about “Green Zones”. Those are unfamiliar to me and I’m wondering if there’s any background people should have going into this course? SC: First of all, all of the jargon or the language that I use in my book is unnecessary. We could talk about it in a lot of different ways. The book, The Five Keys of Mindful Communication, is based on the five buddha families. It has different metaphors: the red light, green light, yellow light. But the basic idea of a “Green Zone” is a community that has the intention to not cause harm with our speech, and so you could say that flagging it as a green zone would be recognized by anyone who had read the book but that we ourselves don’t have to use that language particularly. But we do share the intention that this weekend will be an opportunity for people to actually go into the spacious and beautiful opportunity to interrupt the causes of suffering rather than to act them out. So I think that if anyone does want to read the book or take a look at the Youtube videos that might be helpful, but I personally am not interested in promoting that language in particular. EC: I would like to humbly add this to what Susan has shared. The reason that we communicate is because deeply we want to be understood. And so as human beings we’ve developed this ability to use language, body language, spoken language, and vibrational language to communicate with each other and we have this extensive nervous system, miles and miles of nervous system tissue in our bodies, and mirror neurons that make us extremely sensitive to one another. So it’s very helpful when you can agree to certain terms (meaning certain things) and when we can set forth a paradigm and it’s a simple paradigm. And who can’t relate to or hasn’t seen a traffic light: a red light, a yellow light, a green light. It’s one of the reasons, for me personally, that I’m grateful for Susan taking the time to write this down. Because don’t we all, when we’re on a journey, want a good map and a good guide? And she’s provided that. So humbly I would encourage people to get a copy of the book. Not because Susan is trying to sell books; she’s not trying to sell books. But because it is the distillation of a lifetime of working with these concepts and she found a way to create very simple symbols and language and examples that actually help people get it rather quickly. And that’s a huge blessing, and so worth taking the little bit of time required to become familiar with the book, to go online and look at. If you’re more of a visual learner you can look at some of the videos that are freely available and get a sense of the work. I think that those students who are willing to do that as part of the pre-work will come with a sense of readiness that will contribute to the container of love and kindness and compassion and non-judgement and freedom that we’re trying to cultivate together and really accelerate that for everyone. Q: In terms of this specific course that’s available in Seattle, what sort of things inspired you or did you pull from in terms of teachings? EC: As a person of color who lives in a big urban city — that is, many would consider Chicago one of the most violent cities in the country, where every single day some of our young people are being shot innocently, innocent bystanders — you have to be so careful. I’ve had young people crying to me saying “I don’t know if I’m going to be alive tomorrow”, “I don’t know if I’m going to get home safely”, “I don’t really know what it means to experience peace”. And to sit with someone who’s twelve or thirteen or fourteen crying to you and saying that to you, it creates a kind of sensitivity that raises the response of, “what can I do to help minimize the suffering”. That’s the great bodhisattva vow that I feel all of us deep in our hearts with our basic goodness, we’ve all signed on for that. If there’s anything I can do to help minimize suffering then let me do that. And the work that I’ve been involved with here and around the country has largely been around suffering and this senseless violence, and taking of life, and just destruction of precious life. So I took a chance and said, “Alright, I hope everyone else is ready. I hope I’m ready.” Because we’re stepping into the laboratory of how we minimize and interrupt the cycles of suffering that, if we are not vigilant, we all contribute to. And it’s not because we want to. Some people want to. But a lot of us don’t want to, but because we don’t know how not to, we inadvertently end up contributing to that. So I just, based on the four noble truths, created a very simple workshop, fielded it, and people responded to it really well. I made it as simple as possible. Susan and I were talking about it, and when I give context for this I want you to know that Susan and I both have been through some things. So we’re not coming to everyone from an intellectual standpoint with these teachings. We’re coming from the place of being elders with a body of personal experiences of working with groups of people. Mothers whose children have been shot by the police, families who have lost family members from just violence gone mad and the aftershock waves of that, processing that, and working with police officers who are so traumatized that they themselves are reluctant to ask for help, but they need help so much. So everywhere you turn now there is this manifestation of suffering within a culture now that unfortunately has a type of leadership that supports the propagation of suffering. So those of us who call ourselves spiritual practitioners must be bold and say, “I have an antidote to that.” The antidote the Buddha gave us is in the Four Noble Truths, but we have to practice. And it won’t be an easy practice for us. And it was in these conversations [that the program developed]. Susan has devoted her life to working with vulnerable, at risk populations who’ve gone through enormous traumas and periods of intense suffering and she’s learned ways of minimize that. We’re both in the season of life; I’ll be 65 this year. I consider myself an elder. I don’t want to die knowing this stuff. I want to die having given away what I know to the young people so they can carry the torch forward, carry the lamp and carry it high and continue this work of minimizing the suffering. So it comes from both of us from this place of wanting to share what we’ve learned through walking tough paths. SC: Elesa just described the importance of the Four Noble Truths, and in my book and in the model I use I talk about positive interruptions. How can you come back to an awake body, how can you come back to tender heart, how can you come back to open mind? These interruptions are happening all the time and we have to learn how to value and support that in our conversations, because speech can lead us, as you know I’m sure, to some very dark and scary places, actually. Elesa and I taught in Washington D.C. around how in the moment, when we don’t bring compassion to our suffering it can escalate so quickly into hatred. It’s a very serious outcome. Everything that’s in our mind turns into our speech. And if I can get you to agree with me suddenly it becomes a movement, and that movement can go toward causing harm or towards waking up. And the answer is yes, yes we can show you how to do that. We can practice that lovingly together. We can grow together and really make this beloved community vibrant and real and strong and durable. And that’s the reality that we all want. That’s why we’re here. That’s why we come. That’s why we practice. That’s why we’re drawn. Because we long for that. Q: What should people expect in terms of types of exercises and what kind of practice, or anything else connected to that? SC: I think it’s important to know that we certainly don’t want people to feel that they have to be Buddhist. We want to be able to appeal to marginalized people, to anyone. We want them to feel welcome with a simple human need and longing to connect. We are going to invite people into an intention to work with, we could say, the gaps in our stories rather than our stories. Not to be disrespectful of our stories, but we already know what they are. We’ve had lots of gatherings where our stories come out. This is more to explore that refuge or that safe place of coming back to nowness. So it will be a combination of all the different mindful tools we have between us, which can be playful. Elesa, I don’t know if you’re going to do it, but I know you have a playful potato exercise. The Hot Potato. We have a number of little exercises, communication exercises, and at the same time the basic practice of, I call it, listening to ourselves, which is meditation. You listen to your body, you listen to your heart, you listen to your mind, and that [allows] space to be the ground for how we relate to each other. And then also of course, I think one of the most profound ways that students learn is by asking questions, so we will be encouraging students to ask their good questions. Q: When you say “gap”, can you say a little more about that? SC: It’s really, when you look at the Four Noble Truths, what the Buddha was teaching – and again we don’t have to use religious language around this, it’s just the human experience – discovering what the cycle of samsara is. The gap is discovering that it’s possible for suffering to be ended rather than being perpetuated by our chain of reactions. So the gap is probably, I would say, the most precious gift that these thousands of years of teachings has to offer: that there is an exit. There is an end to suffering. And what that is is right at this moment: looking at you and feeling love and gratitude and appreciation, and noticing and recognizing that moment as being what authenticity is. That it’s actually a gap or interruption in my chain of distracted, habituated patterns. So it really is very human. It comes right down to noticing the color green, noticing your dog; how does your dog feel? Feeling a poignant sense of loneliness and not knowing what that means but just being with that. So these are the positive interruptions. You’re coming back to the present moment; sense perceptions through the tender feeling of human heart and through the mind that is willing to let go of something rather than the mind that goes like a trapeze artist from the next to the next. What is it like to just let go? So that’s what I mean by gap. EC: I think that there’s an additional way of thinking about “gap”, and for myself I think of it from a psychological standpoint, the example of there being a stimulus. The behavioral sciences gave us the example of there being a stimulus and there being a response. I think it was B.F. Skinnard who set forth that theory. That theory relates precisely to Pema Chodron’s teachings on getting hooked. That good, juicy, yummy bait goes on the hook in the water and we’re hungry. And even though we bite down and we’re bleeding, we have a decision to make. Do I let go and lose the bait or do I continue to stay with my jaw tight and perhaps bleed to death? So the gap, in that sense, is the space between the stimulus and the response, which for many of us when we’re in the throes of escalating aggression and violence and prejudice and hatred, there actually is no gap whatsoever. There’s no hesitation. If you bump into me, I’m going to punch you. If you look at me the wrong way, I may shoot you. There’s no gap. And so part of what Susan is offering in the paradigm of these teachings, and the Buddha has offered in a different way, is that there is a way to [work with this] which often times we refer to as this middle, this place of only “don’t know”. But if I stand still, if I breathe, if I relax my body, if I remember my highest loyalty to peace and to love and to kindness and nonviolence, then I choose differently. So that’s an additional way of thinking about this gap that we all experience thousands of times every day. And how we respond when we’re in that space, in that gap, determines the outcomes that are realized in any given moment. Q: If there was one thing you’d like to tell people about this topic that feels like the most important part, what would that be? EC: I have a very simple response to that question and it is in the form of two questions. I ask students, “Do you want to be free?” And I tell them that’s a yes or no question. And if they say, “Yes, I want to be free”, then I ask them, “how free do you want to be?” Because you can be more free than you are right now. That I know for sure. There is a reliable way for you to feel more free than you are right now. SC: I think for myself, when I think of Seattle — I haven’t been there for a year — but to the whole Shambhala community, what we’re offering is really the paradigm about choosing love. And I know there’s an awful lot of other paradigms out there right now in terms of how to grapple with injustice and so forth. As Elesa said, we are two elders who have been around for a while, and for myself I have seen various cycles. I have worked a lot with domestic violence and other kinds of cycles where you think that you’re on the winning side of a social justice issue and you discover it turns into the opposite. So I’m very committed to working with choosing love and really creating as many opportunities to step off of that hamster wheel that goes round and round, where anger or even righteous indignation can turn into hatred without us even noticing it. And divisiveness starts to have its own justifications, you know. So that’s where two elder women can come in with a message. I feel the same as Elesa said; I don’t have that many years left and I have tons of experience and I don’t want to see our community or our world fall into these divisive patterns, that I’ve already been there, done that, got the t-shirt. And I feel this is really what Elesa has given me and I want to really get that message across. That this is really about overcoming the patterns that lead to hatred. That love is actually beyond that. That it’s basic goodness, it’s beyond any of the logics that justify the divisiveness. Q: Is there anything else that you feel is important to add on this topic? EC: I do think it is important to communicate that… I want to say this as respectfully and as honestly as I can: The truth sets us free, and that truth transcends religion and the kind of boxes that we place around certain teachings that actually end up separating ourselves from one another. So neither Susan or I are interested in that. This is an open call to anyone of any background or experience or belief system to come and participate in this laboratory of generating additional degrees of freedom in one’s life and one’s community. And I have built the whole bulk of my teaching career on helping people feel comfortable. And so, while there is an enormous gratitude for the lineage and specific teachings, I try very hard to find comparable teachings in the other world traditions that exist, so that a diverse group of people can feel the common denominator element between us, [which] is [that] we’re all human beings. When all is said and done, we’re all human beings and we have red blood and we have to remember that. We have to focus on our similarities and not on our differences, and so be intentionally presenting these teachings in a non-religious way. I will say more specifically that being an African-American of mixed heritage here in a city where the predominant religion for African-Americans in Chicago is Christianity [means] I’ve had to embrace and welcome people in a way that is not religious. SC: That’s very important to me too. 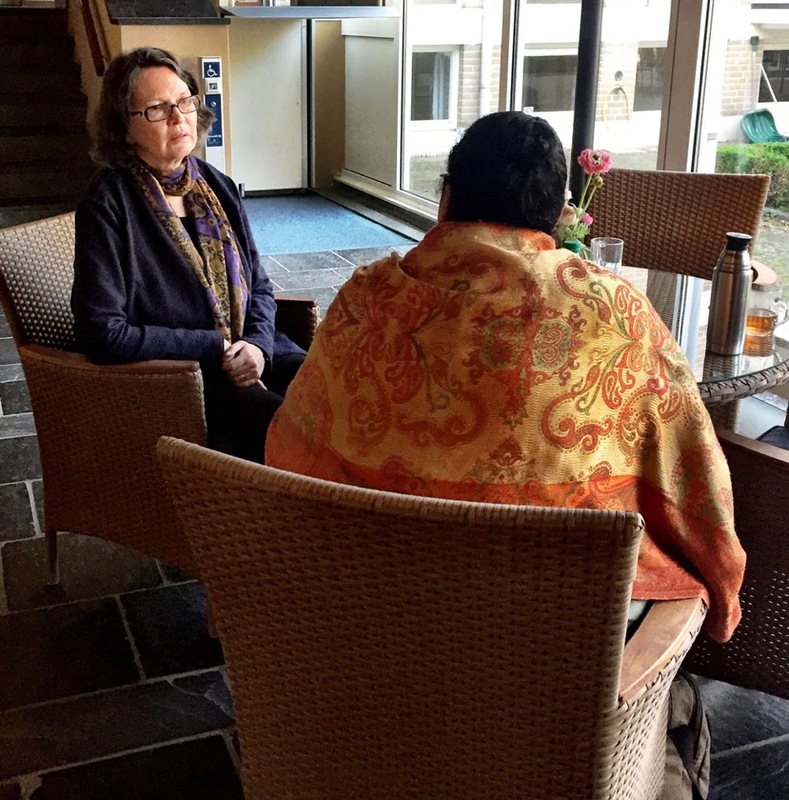 Registration is still open for The End of Suffering: Claiming our Vulnerability as Strength, which takes place April 26 – 28 at the Seattle Shambhala Center. For more information, view the program page or reach out to our Practice and Education Team at practiceandeducation@seattleshambhala.org. This program is open to all, regardless of previous experience with meditation. You do not have to consider yourself Buddhist to participate.